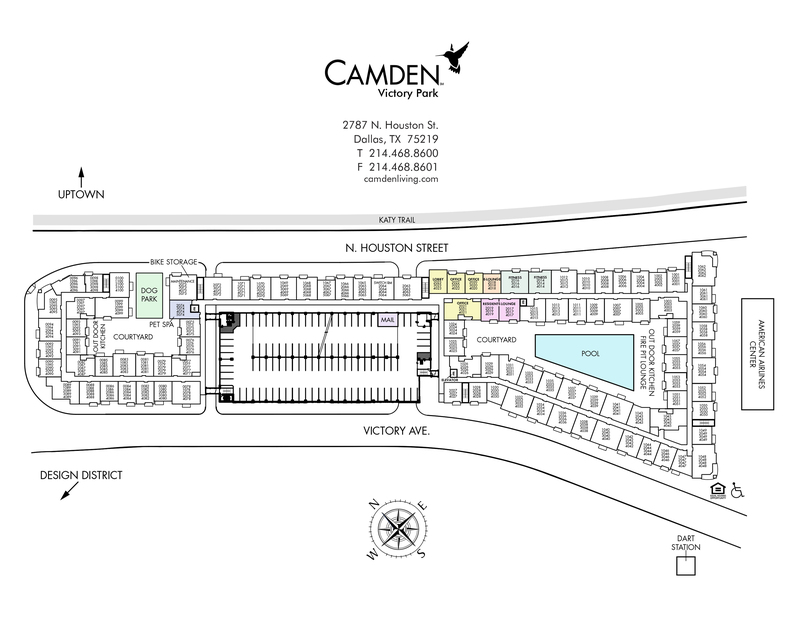 Camden Victory Park offers modern one and two bedroom open-concept apartment homes in the heart of the revitalized Victory Park neighborhood in Dallas. Each apartment home in the non-smoking community features chef-inspired kitchens with modern, dark cabinetry, quartz countertops, mosaic tile backsplashes, stainless steel appliances including glass stove tops and undermount sinks with pull down spray kitchen faucets. Enjoy luxury features like hardwood-style flooring with carpeted bedrooms, garden bathtubs with tile surrounds and walk-in shower as well as patios and balconies with city views. USB-enabled wall outlets, full-size washers and dryers, walk-in closets with custom wood organization systems and at-your-door trash and recycling pick up bring convenience to you. Stop paying for your gym membership because you can work out in the 1700 sq. ft. 24-hour fitness studio with cardio equipment, weight machines, and free weights as well as an on-demand virtual training workout studio. Relax and entertain friends at the spectacular pool with expansive entertainment, lounging and grilling areas. Or bring the fun indoors in the resident lounge with billiards, poker tables and large TVs. There's also an eLounge with WiFi, computers and multi-function printers along with an on-demand gourment coffee station to get your caffeine on while you work. And for your four-legged friends, we offer an exclusive, fenced-in pet park and paw spa pet grooming lounge! Situated next door to the American Airlines Center, Camden Victory Park offers a high-end, peaceful community in a walkable, urban neighborhood. Step outside your front door to cheer on the Dallas Mavericks and Stars or take your pick from an array of concerts and entertainment venues. Awaken your curiosity by strolling over to The Perot Museum of Nature and Science, The Dallas Museum of Art or the Dallas World Aquarium. If you’re in the mood to take in some fresh air, hop on the Katy Trail located just across the street or take a quick trip over to Klyde Warren Park just minutes from the community. Wind down by sipping on your favorite beverage at The W Hotel or slip away to the Bliss Spa for a relaxing spa treatment. When it's time to go to work, enjoy easy commutes with a DART Rail station within walking distance and convenient access to I-35 and Dallas North Tollway. Residents receive a money-saving technology package that includes high-speed internet with speeds up to 45 Mbps and 360 digital video channels with HD and DVR through AT&T U-verse. Use the AT&T U-verse app on your smartphone or tablet to access your digital video anywhere! Are you looking for a modern, high-end apartment community in a great neighborhood full of thriving entertainment and nightlife? Come home to Camden Victory Park! Breed restrictions apply. We do not permit American Pit Bull Terrier, American Staffordshire Terrier, Staffordshire Bull Terrier, or any other dog or breed deemed aggressive. See management for pet approval and deposit and fee information. We have limited access gates, and a centrally located, covered parking garage. Guest parking is available on the top level. A parking permit is required for all residents and guests.